Home » Articles » Are We There Yet? Packing smart to thrive on family vacations. Whether your family is traveling cross-county by car or heading to the beach for the day, packing smart makes travel easier. To make your summer trip as smooth and enjoyable as possible, consider these planning and packing tips. Clean out the interior and trunk/cargo area and get rid of everything not needed on the upcoming trip. Ensure the trunk light works. Check that the emergency kit is stocked with supplies and pack it in the car last. Have a flashlight handy in the glove compartment or console. Pack your vehicle the night before you leave on vacation. Packing always takes longer than you think it will, especially when the family is eager to get moving. This way you can actually depart first thing in the morning, before everyone gets cranky. In the garage, gather everything you plan to take and edit belongings to fit the car. Decide where things should go based on when they will be needed. Remember: Last in, first out. Tuck in a folding luggage cart to haul gear between the car and the beach or hotel room. Fill a cooler with snacks and drinks. By placing the cooler within reach of the front seat, you can get to the cooler without stopping. Keep a trash bag in both the front and back seats. Pack picnic supplies, such as paper plates and bowls, plastic utensils, napkins, a pocketknife, a can opener and a blanket to sit on. Picnic supplies can save parents’ wallets and sanity— just a few picnic meals can make up for high gas prices and reduce frustrating restaurant experiences. Bring plenty of clean-up materials, including tissues, paper towels, wipes, anti-bacterial hand cleaner and extra plastic trash bags. Keep a traveling medicine chest within easy reach inside of the car. Select versatile, comfortable and wrinkle-free clothing garments. Darker colors and prints hide dirt and stains; white and light colors are magnets for spots. Pack with laundry stops in mind. If the first opportunity to do laundry occurs five days into the trip, each person needs five days of underwear and clothing, plus spares in case of emergencies. Pack bags with what is needed first on the top of luggage, like swimsuits for an afternoon arrival at the beach or pool, a change of clothes and pajamas. Bring a large supply of toys and games, and avoid items with lots of small pieces that may get lost, as well as liquid or messy things that can spill. Allow each child to choose some favorites. Play classic games to make the time pass quickly. Encourage family members to look for license plates from different states, count a specific type or color of car and tell jokes. A bonus: With games like these there’s nothing to pack and there are no moving parts to lose! Get kids involved in the trip with assignments appropriate for their ages. One child can keep track of the expenses; another can be the official map-reader. Children’s books on tape and music for young listeners help to pass the time. Portable DVD players are a sanity-saver. Make frequent pit stops. Visit local parks and sights, have a picnic or enjoy a playground en route to your destination. 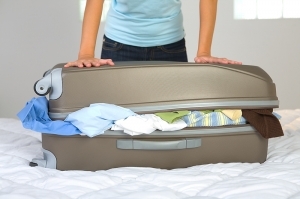 Group small children’s clothes together into one suitcase to minimize the number of bags. Stack a complete outfit, roll up the ensemble and tuck it into a zip-top plastic bag. Include a shirt, pants, underwear, socks— everything needed for the day. Dirty items can go back into the bag. Encourage older kids to choose and pack their own clothes to curb complaints. Enforce a maximum number of clothing articles and specific bag size for each teen. Sometimes soft duffel-type bags fit better than standard suitcases into a car or minivan storage area. If kids won’t be lugging their bags, wheeled bags may be unnecessary. Keep items that may be needed during the day readily accessible, including a change of clothes for each child in case of accidents, sweaters or jackets, rain gear, insect repellent, sunscreen and sun hats. Tuck such items into a small bag that is easy to reach. Ensure the diaper bag is packed with plenty of wipes, spare diapers, some hand sanitizer and a plastic bag for soiled items. Pack an extra pad or blanket that can be used when rest stops do not have a changing station. Every family wants a summer vacation filled with memorable moments that are savored for years to come. Smart travelers know that a little advanced planning and wise packing helps to ensure a great family trip that brims with special memories. Susan Foster has packed and unpacked more than 5,000 times. Foster has traveled constantly for more than 30 years and has spent her entire career living out of a suitcase. Her packing guide, Smart Packing for Today’s Traveler (Smart Travel Press), is available in bookstores, at travel and luggage retailers and online and at www.smartpacking.com.